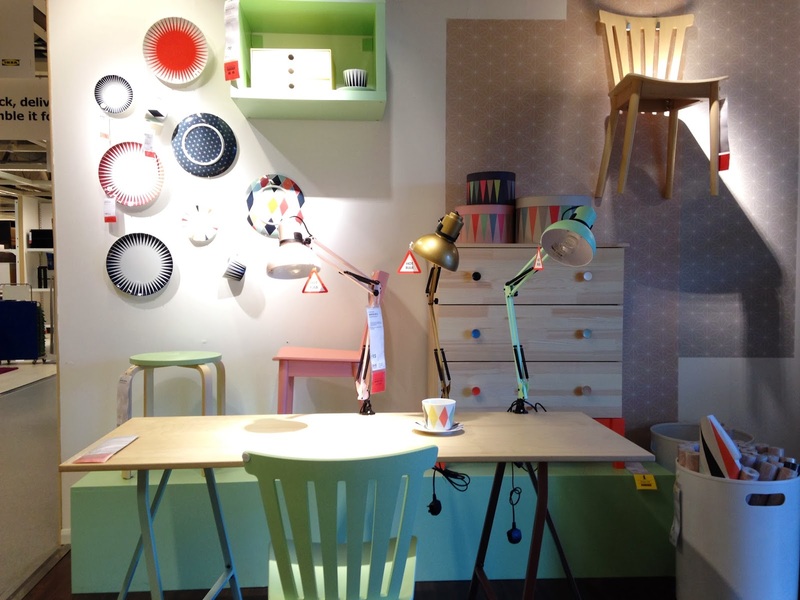 as most of us did, i read many blog posts about the art rebels x bråkig collaboration at ikea. i was surprised how much i loved it despite my monochrome tendencies. the soft pastels and light wood just work so well, and i especially loved the brass desk legs. w o w! i wasn't expecting the art rebels collection to be available in UK stores, so i was surprised when i was greeted by this art rebels "showroom" after i waded through the sofas. i really really wanted the brass desk legs but couldn't find them anywhere. i am going back on friday and will search for them again, but i did get some bowls. i love the stools & the mint chair. there were also a couple of really eye catching geometric lampshades. i think the use of geometrics is really what pulled me in. i thought that there wasn't a lot of emphasis on the collection, which is probably good otherwise everything would have been gone(!) but it was annoying when i was trying to track down the brass legs and the guy i was talking to had no idea what i was on about! it sort of made me want a job there, i would be so excited about the products and man i wouldn't be able to help myself rearranging that display.